Analysis: The specifics of Smith's deal aren't available, but his salary was significantly reduced from the $3.75 million he was initially due. 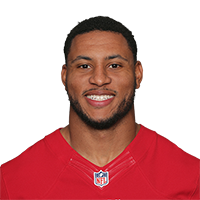 Smith has only played in 12 games over two years with San Francisco, recording 35 tackles (22 solo) and a pass breakup while averaging just 28 defensive snaps per game. He'll likely face competition in camp for the starting job again. 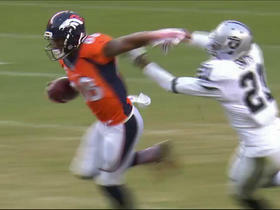 Analysis: Smith is listed as the starting weakside linebacker on San Francisco's depth chart in Foster's absence. The eighth-year veteran's increased snap count could lead to an uptick in tackles, so he's worth monitoring in IDP formats. 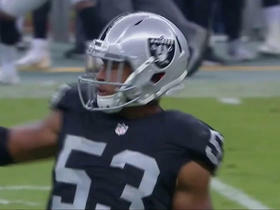 Analysis: Smith played 33 snaps in the Week 9 destruction of the Raiders, tallying just two tackles. With the game expected to be a bit more competitive Monday against the Giants, Smith could have some opportunities to rack up more tackles. Analysis: Smith has been the 49ers' Sam linebacker this year, only seeing the field in base formations (25.3 defensive snaps per game). The move to Will linebacker will up the veteran's snap count, making him a sneaky IDP play against his former club on Thursday Night Football. The increased role could lead to a new season high in tackles, which currently sits at five through six games. 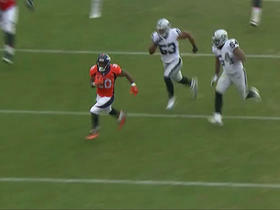 Denver Broncos QB Trevor Siemian hits wide receiver Demaryius Thomas down the middle, who turns up for a 26-yard gain into the red zone. 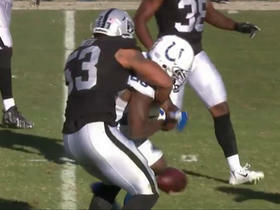 Indianapolis Colts running back Frank Gore fumbles and the Oakland Raiders recover. 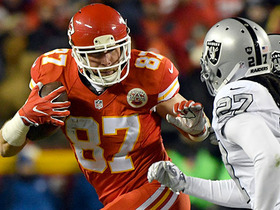 Kansas City Chiefs QB Alex Smith strikes a pass to tight end Travis Kelce for the 28-yard gain. 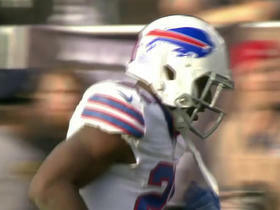 Buffalo Bills running back LeSean McCoy shakes defenders on a 9-yard run. 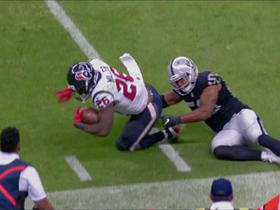 Houston Texans running back Lamar Miller rushes for 1 yard and is ruled short of the first down. 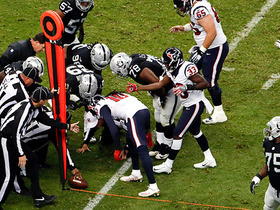 Oakland Raiders linebacker Malcolm Smith comes up with a crucial stop on 4th & inches on Houston Texans running back Akeem Hunt. 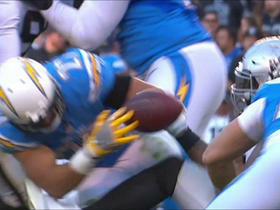 Houston Texans QB Brock Osweiler is intercepted by Oakland Raiders linebacker Malcolm Smith. Denver Broncos QB Trevor Siemian connects with tight end Virgil Green for 26 yards.